I have the new floor in and it's time to build the insides back in. I rebuilt the framework of the kitchen counters and had a new countertop made. 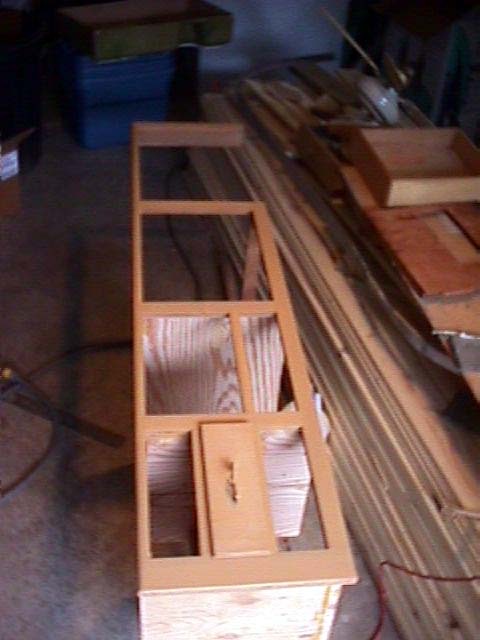 As I write this the counter is in the garage, and the framework has one coat of finish on it. If you've seen the inside of one of these, you realize they are finished in Birch. At least all that I've seen. At least that is what I thought. When I started stripping off the old finish, I found that the doors were indeed a birch type plywood. Very nice looking wood. But, surprise - the framework, at least of the kitchen counter, was plain pine. It had some sort of glaze that that made it look nearly like brirch. With it stripped, it really looked cheap. The problem was how to make it look like Birch, or at least like it belonged. I took the half stripped cabinet to the paint shop and they were puzzled. They hadn't seen anything like it, but were up to a challenge. They spent the afternoon experimenting and the best they could come up with was a latex paint that was about the right color, and with one coat put on thin, it left brush marks that resembled grain. I have to give it another coat of finish, then steel wool it and see how it looks, but I think it'll be ok.
Nellie and I had a session this evening trying to decide how to finsh out the inside. My plan had been to install the maximum amount of storage that I could devise, with a small, 2 person seating arrangement. She thinks we can get by without all the storage, because unlike our boat, which we go out on for 6 months at a time, we'll only be gone for days. So, at this time, we're leaning towards getting rid of the table that drops down to make a bed, and installing a table that sits on a pedestal, with a lot of seating. If so, I'll arrange it so that the table and pole can be removed and stored giving as much open area as possible when it's not being used. Stay tuned - plans can change. The other major part to be done is to re-install the plumbing, and add the gray water tank. I've identified a 17 gallon graywater tank I believe I can install inside of the original fiberglass pan. If it works out, I'll post some details so others can use it. If it doesn't, well, it'll be back to the drawing board.